One of the clearest evidence of the economic ties between Texas and Mexico have been in full display in the last five day since Trump announced he’d “close the border” as a response to the “humanitarian crisis” of central Americans arriving to the U.S.-Mexico the border. Publicly, and privately, businesses who tend to support Republicans, the U.S. Chamber of Commerce, Wall Street Journal, the influential The Texas Association of Business and Texas elected officials have warned Trump that they will not support closing the border since it will create chaotic economic consequences for Texas and the nation. And there’s a reason for it. 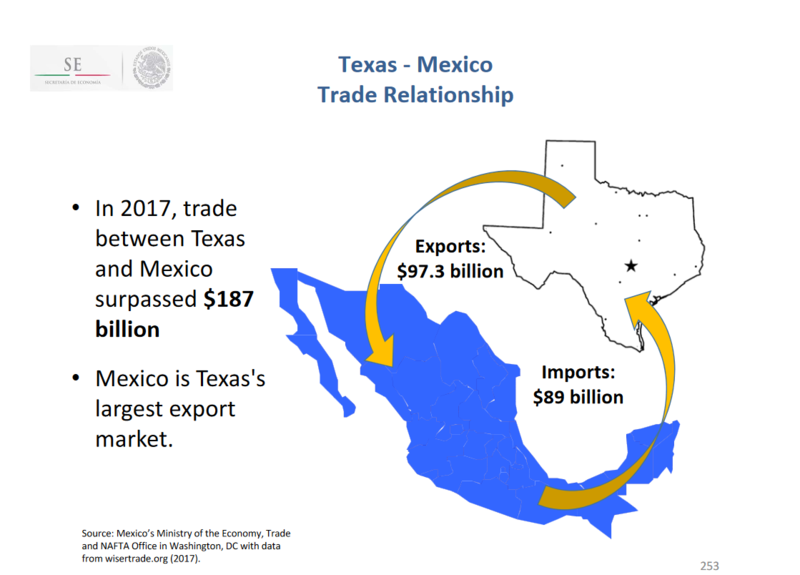 The Texas economy, more than any other state, is connected to Mexico by 1,250 common border; and this long border, is key to the thriving Texas economy. Businesses Republicans, interest groups and Texas Republicans love phrasing Texas has the perfect “red state model” of low taxes, fewer regulations that, in their views, lead to “economic prosperity, or economic freedom. However, if these “red state” arguments indeed lead to more economic prosperity, every single “red state” with similar laws would be as successful as Texas. But that is not the case. Most “red states” in the South and the Heartland that, like Texas, have “low taxes” and fewer regulations are very poor and lag behind in competitiveness and economic development when compared to national standards or “blue states,” Texas is the exception. The reality is that Texas is a thriving, not because is a “red state” state, but because it became the heart of NAFTA. Under NAFTA, Texas’ largest exports to Mexico “include oil, natural gas, petrochemicals and motor vehicle parts. Eighty percent of Texas’ dairy exports, and 84 percent of our poultry exports, go to Mexico. 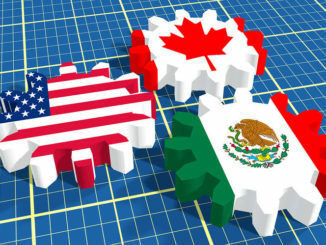 More than one million Texas jobs, or eight percent of total state employment, are supported by trade with Mexico and Canada,” according to a recent analysis by the U.S. Chamber of Commerce. In addition, NAFTA is the lifeblood of many communities in Texas, especially those along the 1,250-mile border with Mexico. And has this has nothing with a red state model and more with the geographical location of Texas that naturally connects its 1,250 miles to Mexico. 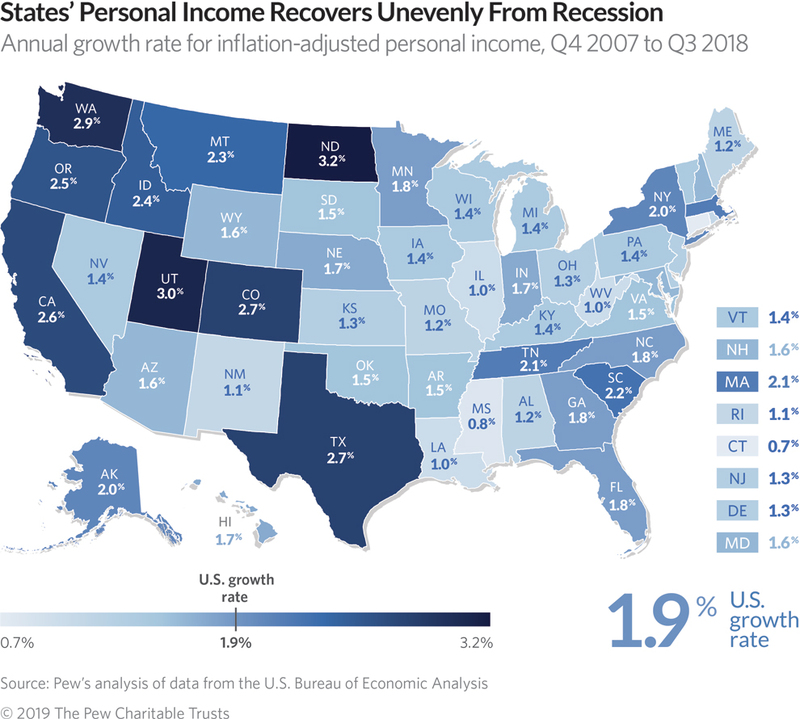 Texas is the only state in West with real economic growth since the start of the recession – see to Western States Lead the Pack in Key Economic Indicator by Pew Western states, and Texas, are only the state that have recorded three times the rate of growth in total personal income as last-place Connecticut (see map below). 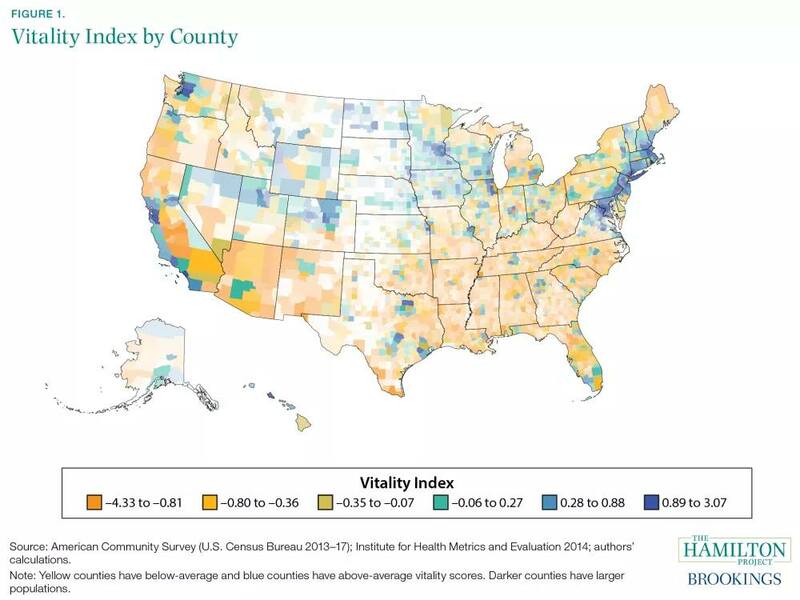 Similarly, the map below is The Brookings interactive geography of prosperity map that shows stronger “Vitality Index” in the country. Note that in the South only the metro ares of Texas show a strong “Vitality” similar to many ‘blue states” in the Mid-West, California and New England. Unlike other “red states,” what makes Texas such successful red is its geographical location. These 1250 miles of border with Mexico is filled with border communities that cross the border each day; an estimated of 1 million of people cross the border legally and about $1.7 Billion trade crosses the U.S.-Mexico every day. California is the largest economy in the nation, but only shares 400 miles of border with Mexico. Mexico is Texas’ number importer; about 40% of Texas exports go to Mexico. 44% of all NAFTA trade come through Texas. 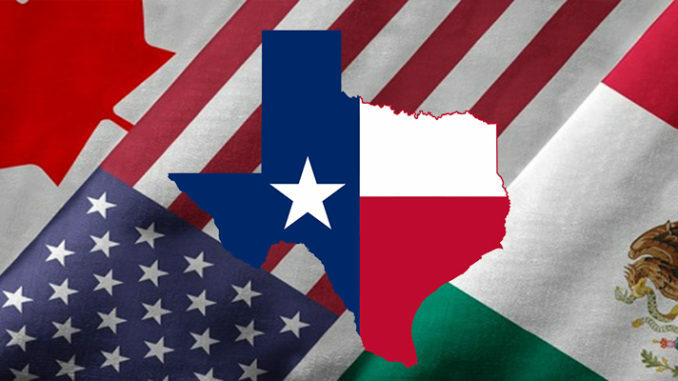 Bilateral trade between Texas and Mexico is $187 Billion. Texas is regionally connected to the industrial heart of Mexico with highways linked to all NAFTA routes. 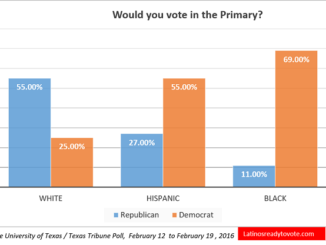 Both California and Texas have similar demographic populations where 40% of the states’ populations are Hispanic; but unlike California where 80% of the “Hispanic/Latino” population is Mexican-American, in Texas 90% of all Hispanics are Mexican-American. Texas has more “sister cities” in Mexico than any other state. The Texas-Mexico Automotive Super Cluster (TMASC) is a transnational region consisting of Texas, #Tamaulipas , Nuevo Leon, Coahuila and San Luis Potosi. It’s home to 27 automotive assembly plants and over 230 OEM supplier plants. Moreover, if the “red state “suggesting that Texas is so successful only because this red state, why California’s economy as successful as Texas? The answer is California, like Texas, shares a border with Mexico. Moreover, California is America’s largest state economy, followed by Texas. Texas reigns supreme among “red states.” What Texas has that other red states don’t have? Mexico. According to the U.S. Chamber of Commerce, there is an estimated $634 billion of trade between The U.S. and Mexico. As I noted previously, 44% of NAFTA trade come through the ports of entry located in Texas generating about 1 million jobs, according to the U.S. Chamber of Commerce. Trade between Texas and Mexico surpassed $187 billion in 2017. California trade with Mexico is only 90$ billion, only half of that of Texas. But that can be explained in miles. In Western Economic Indicator map by the Pew, Texas is the only red state with equal the economic growth to Western state, especially like California. Why that is? 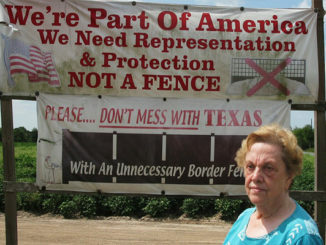 Texas is sharing 1,250 miles of border with Mexico. California shares only about 400 miles with Mexico. The border between Texas and Mexico is three times larger than that of California. In this 1,250 common border between Texas and Mexico, hundreds of communities lived depended on each other for jobs and every-day commerce that travels both ways. and this economic activity can only happen in Texas thanks to its geographic location connecting it to Mexico. NAFTA is the lifeblood of many communities in Texas, especially those along the 1,250-mile border with Mexico. If California had 1,250 miles border with Mexico, as a “blue state,” California trade with Mexico would be even greater than that of Texas. Even if “red states” like Louisiana, Mississippi, Alabama, Arkansas, Kansans, and Oklahoma that are deemed “low-taxes” and “low-regulations,” why aren’t as successful as Texas? They are not lucky enough to have Mexico next door. This the 2019 list of states with the “Best States Business Tax Climate,” and while Texas is not on the top, Texas, like Mississippi, Alabama, Georgia, Oklahoma, Kansas and Missouri, state that have a “friendly” business climate. Yet, when new look at actual economic recovery by the Pew map, and the economic “vitality” by the Broookings Indext, red states states lag far behind, compared to Texas and most blue states. There is a say in Texas that goes “God Bless Texas.” Indeed, Texas is blessed, it is blessed by having Mexico next door.